I would really love to be able to document Roo and Jasper's lives with the JVC Everio GZ-HD320 Hi-Def camcorder. We've never owned our own camcorder, and this one looks portable enough to realistically imagine using it on a regular basis. I might have even let Bob record their births if we'd had something like this… I like the fact that you can upload to YouTube or your iPhone with one touch, that would make sharing with our families very simple, too. We have a Flip camera that is great for taking short clips but this camera looks like it would be good for recording longer programs like school plays, sports and recitals, too. To enter the contest, I'm supposed to tell you a bit about my birth stories. Both of my kids were born without epidurals but both were induced. (I hate pitocin, y'all. It is a terrible thing.) Roo was a day past her due date, which is probably a good thing since it was a leap year and she was due on Feb 29th. Aside from having the pitocin to speed up the contractions, it was a smooth delivery and only took about 8 hours of labor. Roo pretty much came into the world as she is now, eyes wide open and twinkly, ready for fun! Jasper was induced about a week before his due date because my doctor was afraid I would develop high blood pressure and that he would be too big for me to deliver naturally. Well, he ended up only being 6lbs 12 oz and was a moderately easy labor and delivery but he must have sucked up some amniotic fluid that made his breathing labored. A couple of hours after he was born, we were informed he was going to have to sleep in the NICU, which totally freaked me out. He looked fine, seemed fine, but his oxygen levels were off and he wasn't a pro nurser like his big sister was. So we got wheeled out of the comfy, cozy birth care center through an underground series of tunnels to the regular hospital. Which sucked. I was totally upset because the baby was taken away and I couldn't nurse him. I was positive he was going to die, that something was really wrong. He eventually spent a week in the NICU on antibiotics because the doctors were afraid he might develop pneumonia or meningitis, neither of which ever showed up. Apparently, once you start the course of antibiotics, the newborn must remain hospitalized with an IV. I spent that week familiarizing myself with the wonders of the fabulous hospital-grade Medela Symphony breast pump. I visited him several times a day to try and bottle feed him my breast milk and it was so hard to leave him there. Bob thinks I'm totally full of it but I think Jasper's clinginess even now is related to the fact that he was hospitalized and kept away from me when he was so little. He still has some serious separation anxiety, even at 19 months. Spending all the time in the NICU made me realize how truly lucky we had been with Roo. She was so healthy, so happy, so content. Jasper was poked with needles constantly and had roommates and monitors bleeping and bright lights and feedings and diaperings every couple of hours. It's no wonder he's so much grumpier than his big sister, I guess. The nurses in the NICU called him the big, happy boy and compared to the other babies he was certainly much better off. The preemies on life support and grieving parents made me appreciate how lucky I was to have a baby who would almost certainly go home with me and live a long, full life of irritating his big sister. I felt so guilty that I'd been almost hysterical about having to leave him in NICU when it was so obvious that he was going to recuperate. It was hard not to be able to take him home immediately but I know others were not as fortunate. And when we did finally get to take Jasper home, we knew he was going to be okay. Thankfully. *Wow, I totally didn't mean to make this sound like a freaky infomercial for how cool Kristin is but, uh, she is pretty cool. She is young and a full-time student but she takes the time to help newbie bloggers out, answering questions and directing their efforts on the Extraordinary Moms forums. She has given me advice and helped me make some great contacts in the blogosphere and has been a good friend, above all. Go read the entry instructions JVC camcorder contest and say hello, already! If you write about your birth stories, leave a link below so I can check it out, too. Naomi you're one of my longest bloggy buds and friends here. I think you're pretty cool too. I had no idea about Jasper what an adorable little guy. See this is why I want to hear birth stories. Just for this reason. Better connect as to why we're all here in the first place. MOM! I saw your comment at Amanda's and I told her you two can totally spoon on the floor in my room. You're more the welcome I'm sure she'd LOVE the company. I kick in my sleep. There's no spooning with me! Oh and p.s. Jasper was such an adorable baby. I don't think I've ever seen a baby-baby pic of him. Oh how cute!! Love reading birth stories. So so glad that everything worked out in the end with Jasper - Both of your children are adorable and lovely. 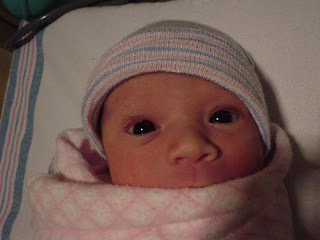 That is the cutest newborn picture I have ever seen, with Roo and her piercing stare! It's amazing how they both have retained their youthfulness. Emil was induced as well, for the same reasons but I was heavily medicated. It was a wonderful delivery!! I loved reading your story, and I too hate pitocin! It is the devil that led me to a c-section, I'm positive of it. I was doing fine until they insisted on using it. 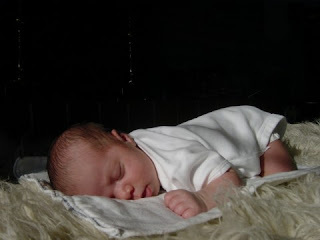 It's so hard to imagine Jasper as that little tiny baby in the NICU, since he seems so vivacious now! And Roo does look ready to have fun. I already miss that stage of babyhood, when they're first born and so tiny. Awesome Baby photos. So Sweet! I don't blame you, Kristen is pretty great! I love those photos of your children as babies. They're so adorable! Aww, what cute pics of your babies! Aren't those hospital grade pumps fantastic? If they were more within reason (I think I looked it up and it was like $800 bucks) I don't think pumping would be so bad! Oh, and I agree with you about the whole separation thing--my son is only 6 months old and I can already tell he is the clingy type. Maybe because he spent a week in the NICU too?